Prior to my purchasing this example, I had never seen another one except in a Sport-American Guide. The typical Topps production rip at the top is present and this manufacturing artifact has been discussed at length previously. 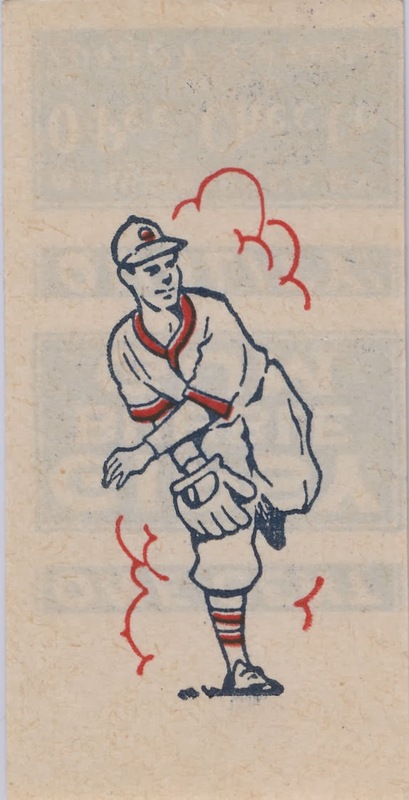 The size is the same as the 1953 Topps Tatoo issue at 1 9/16" x 3 1/2". 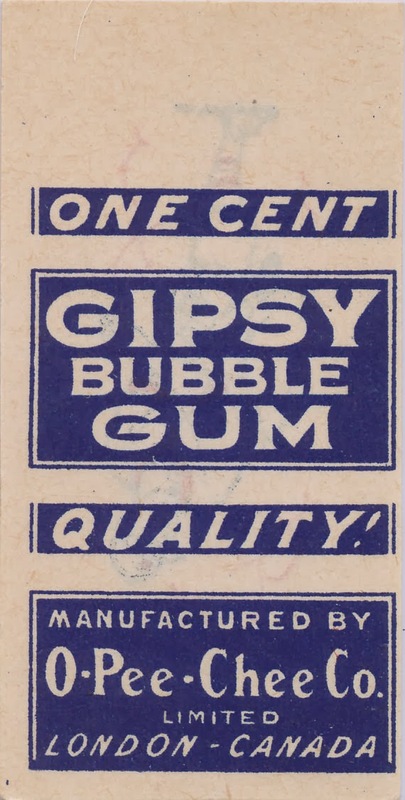 Since Topps did not establish itself in Canada until 1947, if Gipsy came first then it could mean O-Pee-Chee provided Topps with the images for their first novelty set. As O-Pee-Chee was a far more established company, this makes some sense. The 1948-49 Topps Magic Photo issue also used images from a photographic art agency or two and were not original creations. Canadian sets, amazingly, are not fully catalogued and there was a lot of great stuff issued up North well into the 1970's that nobody down here below the border really knows about. The Tatoo/Gipsy connection is intriguing and I hope to ferret out more about it. 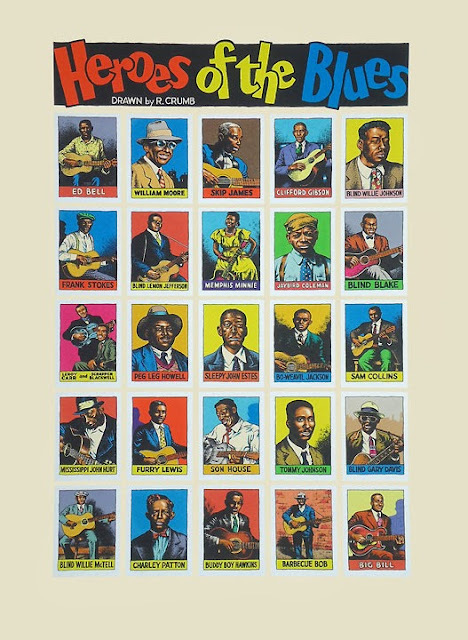 It's not necessarily unknown in the hobby but the fact that Robert Crumb did some artwork for Topps in the mid 1960's is certainly a something a little more well kept than you would think. Crumb did the majority of the artwork for the 1965 Monster Greeting Cards set, a series of fifty standard sized cards as Woody Gelman started hiring artists, some presumably starving, that were a bit offbeat. 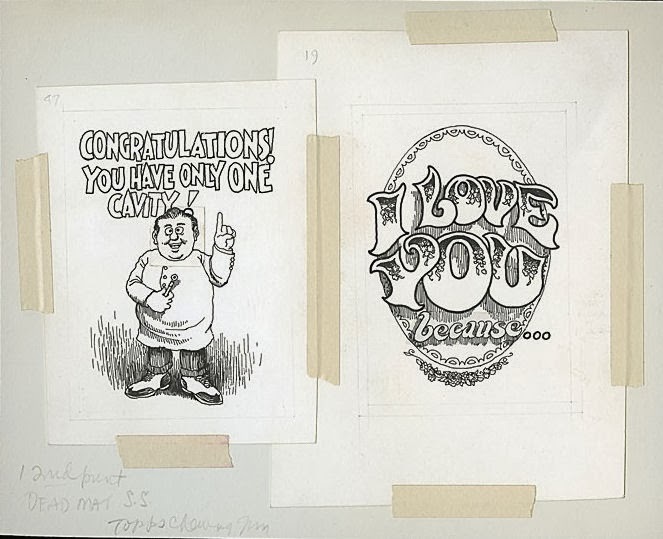 Crumb had not yet started his underground comix work when he moved to New York City in 1965 to work at Help! 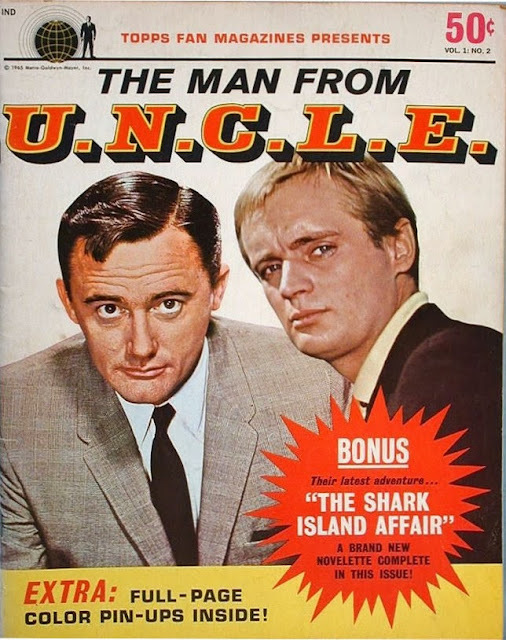 magazine, a humorous and groundbreaking rag founded by Harvey Kurtzman. Long story short the magazine folded and issued its last gasp in September of 1965. Whether or not Crumb did his Topps artwork before or after Help! went under is not something I have put too much time into figuring out but he clearly needed the extra income either way. 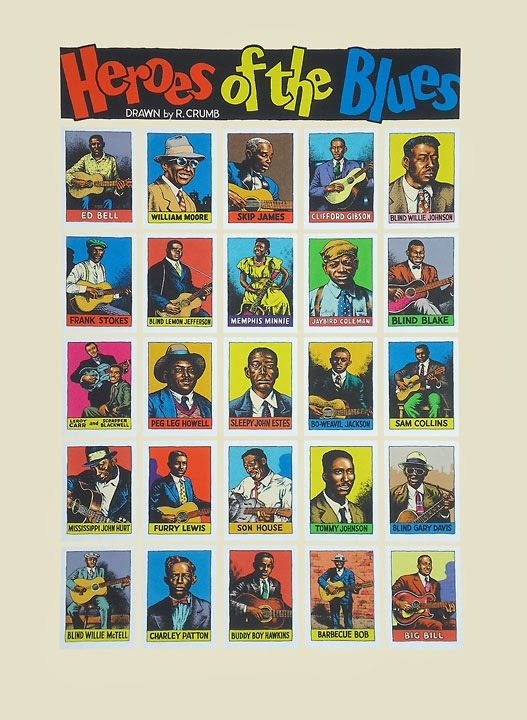 Crumb illustrated the majority of the cards but some featured photography so not all of the possible 100 sides are his. In the recently concluded Fall 2013 REA auction two original Crumb artworks were auctioned. The back is somewhat in the vein of material appearing in Help!, so that is interesting as well. There are 36 cards in the set and they are a little larger and squarer than standard cards are. There are some other Crumb sets out there like this but I think only the blues and jazz sets are still in print. They have both been available for over 30 years and can be purchased to this day off the R. Crumb website. Woody Gelman was hip to the jive as Jay Lynch once said; he was certainly hip to up-and-coming artistic talent! The first thing that jumps out at you is that the game action shots all appear to be in their own 44 card section and the more solid color backgrounds are segregated. It's not quite true though as some action shots are mixed among the colors if you look closely. It's also worth pointing out that this is an 80 card set and not an 88 card one, which would normally be how Topps would number things with this press sheet setup. 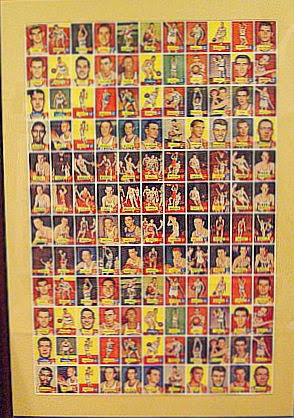 However, I believe that each of the eight NBA teams back in 1957 could only sport a ten man roster, hence 80 cards in the set (if they had added the coaches it would have worked out!). So eight cards on this half sheet had to be double printed. If you look at the top two of the action rows you can see that six of the rightmost cards in them are double printed on this sheet, one version atop the other. Then go along the bottom row, third card in and you will see the other DP, again top and bottom (the pair is replicated up top as well, just harder to describe the location). So that is a quadruple Print (QP). Six DP's exist then (12 slots) as well as one quadruple printed player (4 slots). The rest of the game action cards are Single Prints (SP) using that logic, leaving 32 SP's to make up the rest of the 44 card midsection. For these seven "overprinted" subjects 12+4+32=48 Slots. That leaves 84 slots, which works out perfectly (remember four slots of what would normally be 88 are taken up by the QP card) to 42 DP's among the two color sections. Since each color card other than the QP appears twice you can work the math a different way that yields 42 DP color subjects +6 DP game action subjects +1 QP subject +32 SP slots. (42x2)+(6x2)+(4x1)+32=132 cards. 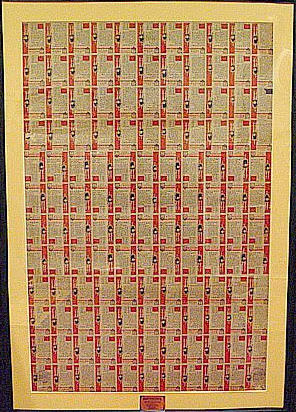 Now this being Topps, there should be another half sheet where the action cards each have a 44 card section sandwiching the color cards but it seems that did not happen and each half sheet was the same. There is also a wealth of reference material on this set that has between 30 and 40 cards described as SP's and given the array of this sheet, the 32 SP's fall right in that range, all in the game action middle layer. The color cards are on the top four and bottom four rows and you can see enough detail to know they are printed upside down while the action cards in the middle had properly oriented backs. I have never seen Topps do this on standard sized cards, it's very strange for them not to align solid blocks of color on the whole of the sheet. 1957 was their first year of standard sized cards and 12 x 11 sheets so I guess they were working the kinks out. 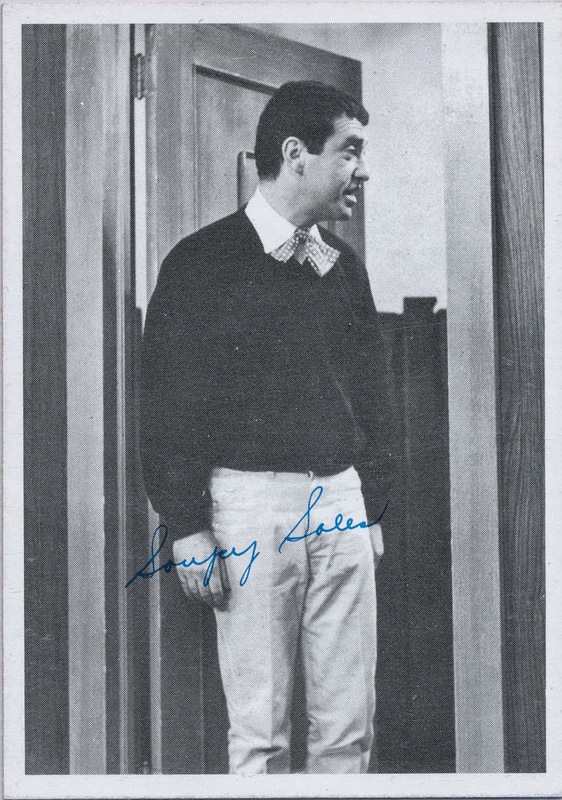 For as long as I have been aware of the cards, there has been a persistent bit of conventional hobby wisdom that states the circa 1965 Topps Soupy Sales cards also came in a thin paper version that were wallet inserts. I've always thought that was a bit of an odd thing for Topps to do but recently an eBay auction appeared that gave me pause. 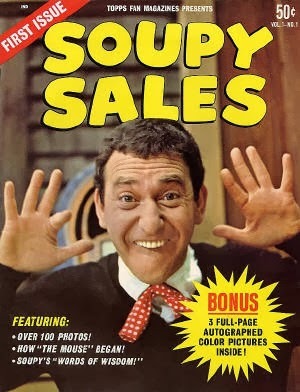 Even though the current pricing of them does not support it, Soupy Sales cards have always seemed to me to be a bit harder to find than your average card of the mid 60's. I suspect they sold poorly and were subject to heavy returns from the jobbers. There are also some very scarce color Topps Soupy cards that are believed to be from 1967 (I think they are a little earlier) but all known versions of those come with blank backs. I wonder if Topps prepared color backs for those and then when production was abandoned, was able to repurpose them for the wallets. Stranger things have happened at Topps but I admit it's a bit of a farfetched theory. 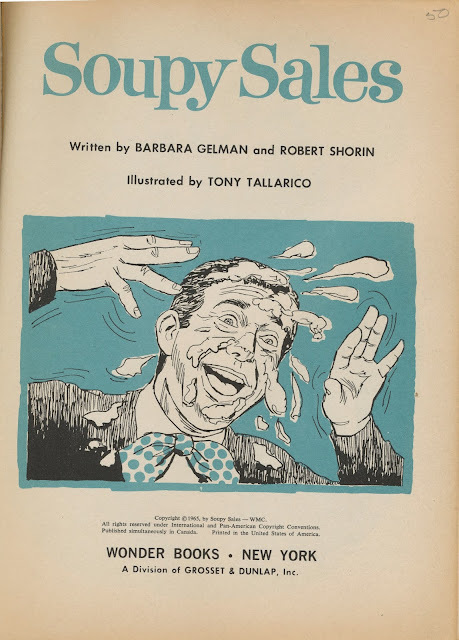 Barbara Gelman was Topps Creative Director Woody Gelman's daughter and Robert Shorin the son of Topps co-founder Abram Shorin. 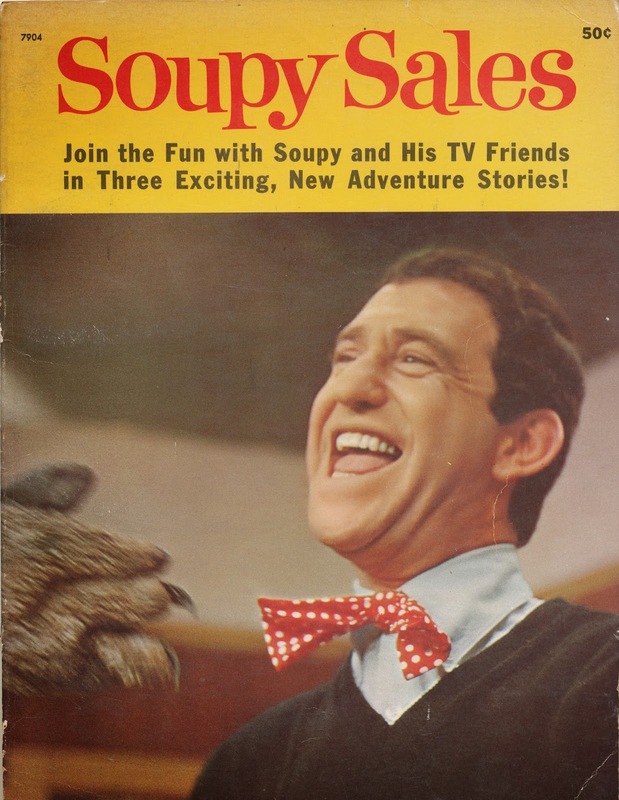 So far as I can determine, other Soupy-themed Wonder Books were not the product of these two author's pens. 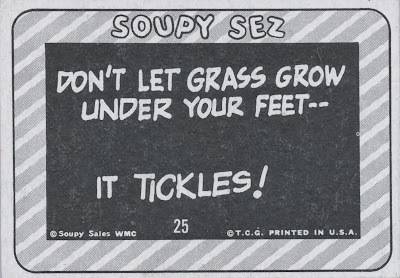 The comic is dated January 1965 (which just reinforces to my mind the 1965 date for the Topps Soupy Sales cards) and there is a connection between Topps and Archie, namely a series of Blony gum comics a few years prior. That scan was posted by David Davis over at the forum. I don't know what lurks within but am told there are replicas of some of the Topps Soupy Sales cards shown. 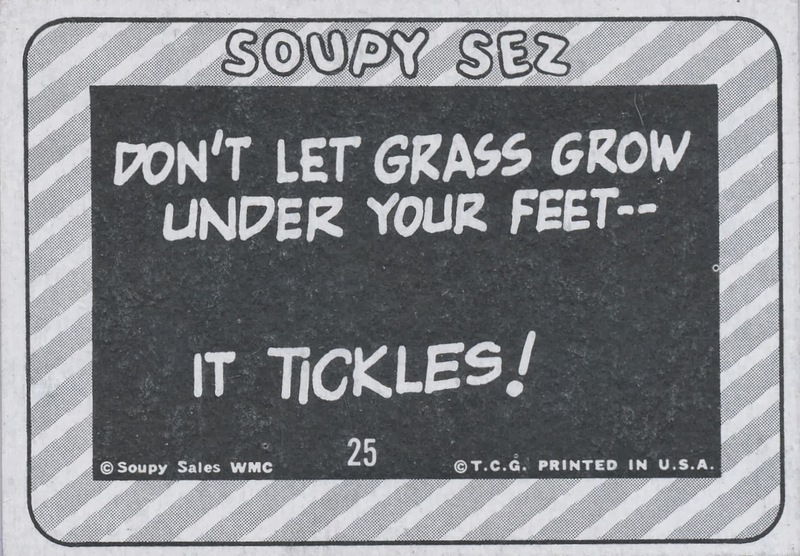 I'm not sure what to make of all this love for Soupy by Topps but it's pretty neat stuff. I'll post the insides when my copy comes in the post; hopefully I can find a No. 1 somewhere or get scans.